You have learned to accept the agonies of the Sympathy. The Aralunate crawls like a powerful hand, and when its towering fingers are snapped or twisted in a sortie, you feel it in your limbs: the gunshot pop of a broken leg, the crushing pressure that jerks your arm away from the control panel and bends it backwards. That is familiar. That, you can endure. When your mech lowers itself to rest on the heel of its palm and curls its fingers inward, you are secure in its grasp, though your body is broken. You are its heart, beating and beaten in the blood-slick cockpit. As it lends you its power, you lend it your senses, your vitality, your Sympathy. It is only fair. It is all you live for. It is the reason they keep piecing you back together. 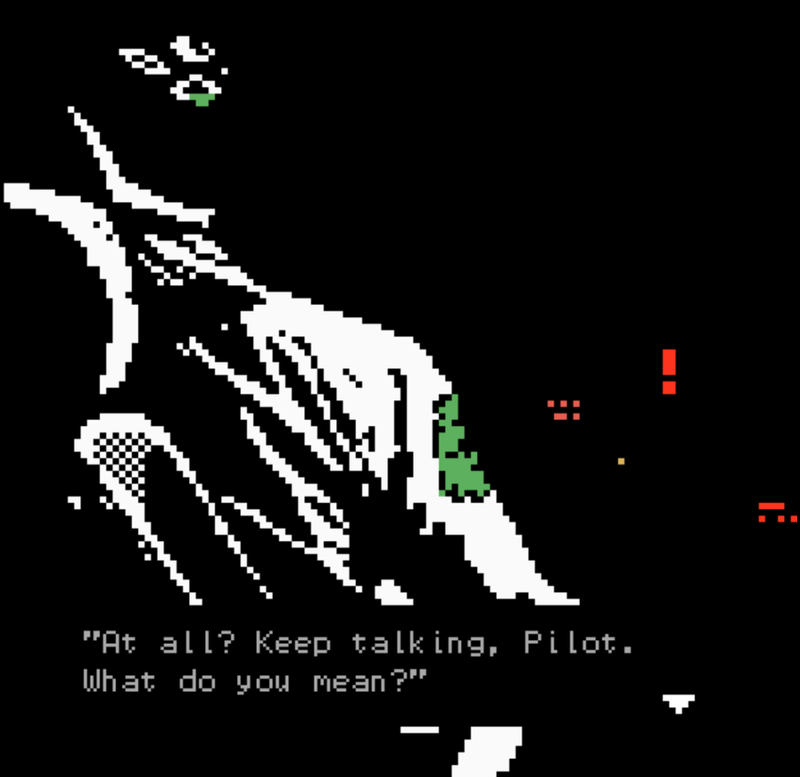 A good excuse to bust out my unfortunate four-eyed alien clone mech pilot character for the Bitsy Mech Jam and the Emotional Mecha Jam. A vignette from a gothic sci fi world made in collaboration with @ghastarium, featuring a guest appearance from their character Antares, whose dialogue they provided. Created with Bitsy by Adam Le Doux, using image-to-bitsy by ruin, music by Monplaisir, and hacks by Sean S. LeBlanc. oh this is fantastic! delivers a really strong mood and a lot of really cool worldbuilding in such a small space. DANG that's spooky!!!! love this!! this is everything!!!! i really appreciate how much work you put into the different visuals + animations, it kept things engaging and elevated the dialogue. really excited to check out more of your stuff. also, i'm still trying to figure out for myself how you did the static text, that was so so good. all i can say is DAMN, GURL!!! !